Finding meaningful gifts in stores is a struggle. Things usually seem too generic or are too expensive, and a cooler version of almost anything is awaiting creation back home with a little time and energy! Boo and Kali, my older sister Sarah and her boyfriend’s two pups. This year I created art quilts for my family. I went about collecting bits and pieces of fabric, first from my grandmother’s fabric shelf and later by scouring the clearance priced remnant bins at fabric stores. I supplemented my new fabric library with some quilter’s pre cut cotton rectangles called fat quarters, sometimes sold in little complementary bundles. Colour was obviously important, but as I progressed I really enjoyed experimented with different materials and textures. Not exactly an art quilt, but a detailed sewing project nonetheless! Colin and my sister Emma showing off their shirts. Choose and simplify a picture. I used Sketchbook Express, a basic photo manipulation program, to block out chunks of similar colour in my picture, making the image as complex or as simple as I liked. I would squint at the picture and, on a new layer, I outlined where I saw a border between lighter and darker colour using the paint brush tool. Then I’d simply choose a representative colour from within that area and fill up the new shape. Sometimes I radically changed the colours, while keeping the general light-dark value of each section. The picture can be simplified with good old fashioned paper and pencil too! Match fabric to chosen colours. Sometimes this means another excursion to the fabric store (or granny’s shelf!) to find a specific colour, but I like the challenge of using what I have at home – perhaps an old t-shirt is the right colour?? It is important to consider the scale of your image to ensure the pieces you choose are large enough, especially when dealing with scraps of fabric. Trace the pattern for each piece onto fusible web. For the larger projects I printed the image to scale, then traced each different coloured section onto fusible web. With smaller projects I simply traced my computer screen (after zooming in/out to get the desired size overall). When tracing, leave obvious overhang on pieces that can go behind other pieces – this ensures you end up with a gap free puzzle when you fit the pieces together later. Wherever possible, keep this overlap system simple, kind of like a topographical map with obvious peaks and valleys, or an obvious flow of bottom layers that become a base for top layers (in my first project I had way too many pieces going simultaneously above and below another layer…not easy to deal with later!). – The fusible web will be fixed to the back side of the chosen fabric, so you will get a horizontally flipped version of the piece you traced. You can either flip the entire image at the start to end up with the original image (probably a good idea for recognizable faces) or just trace as it appears and end up with a mirrored image of your picture. – Take note of which part of the image and which colour each section of fusible web represents. It may seem obvious in the moment, but pieces can get flipped and turned around very easily. Fuse the fusible web to your fabric. 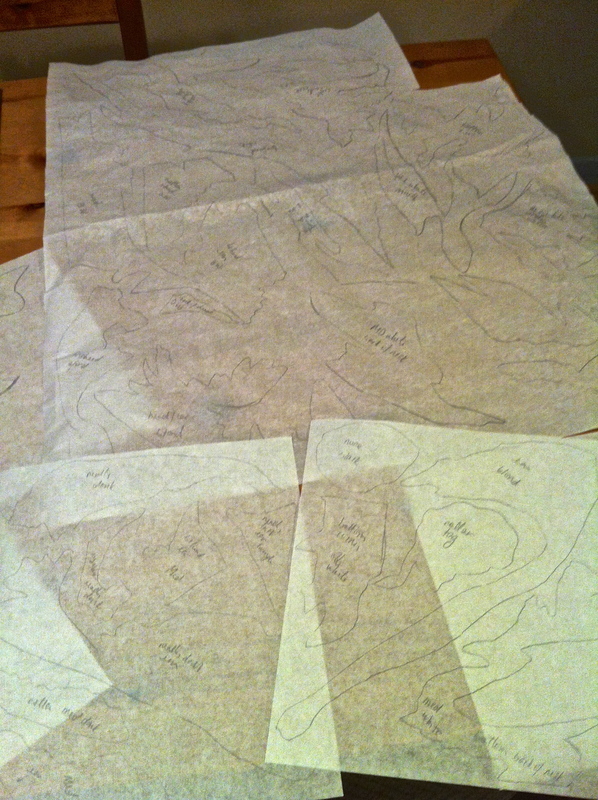 Roughly cut around your traced shapes leaving some room on all sides. Following the ironing instructions for the fusible web, affix the shapes to the coloured fabric you chose to represent each section. This is where writing the colour on the pattern as you trace comes in handy! Cut out your shape with more detail. Cut the exact shape you wish to use from your new fabric/fusible web combo. For the few smaller pieces that sit on top of all the other layers of fabric (for example, Boo’s black nose), the cut will be exactly on the traced line. However, most pieces will require a combination of precisely cut edges along the traced line, as well as edges with some overhang beyond the traced line, wherever the piece will be covered up with more detailed pieces. Fit the pieces together. With a warm iron on standby (once again following the fusible webbing instructions), peel off the paper backing and arrange the pieces on a fabric background beginning with the bottom layer. Iron in place. Add details and embellishments. This is an optional step. If you use lightweight fusible web you can sew lines through the layers of fabric (heavy webbing can jam your machine). Sewing can add dimension and shading, and permanently affixes the pieces (this is recommended if it will be washed, as on a t-shirt). I also added a bell to the shirt for my younger sister. I have yet to tackle the process of adding the backing to a quilt, though Boo (and her owner, my older sister) are patiently waiting. You did a wonderful job on all your gifts this year, Jen Marie. It is always pretty special to have something made just for you! Wow! That is some serious craftin’! I can’t imagine the patience required. Yep, I considered including “patience” in the required materials but didn’t want to scare anyone away! Though I find the involved tasks vary enough to keep it fun.